"An atom is the smallest component of an element having the chemical properties of the element, consisting of a nucleus containing combinations of neutrons and protons and one or more electrons." For most of us, science is a collection of disconnected facts. Or science is a bunch of experiments you did with a partner that invariably never even got close to what you were supposed to get — remember measuring Avogodroo’s number (6.022140857 × 1023)? And why was that number important, anyhow? No wonder lots of adults think that STEM is the thing to which a flower is attached. But, science education is changing — and changing big time! According to the Framework for K-12 Science Education, science isn’t a bunch of facts; science is tool for explaining phenomena. For example, why does thunder occur after the lightning? Science is about using knowledge to figure things out, e.g., why do species go extinct? Science is not about accumulating inert facts about species, but about making sense of the world in which we live. The Framework — and its successor, the Next Generation Science Standards — is "new, provocative, and exciting, and represents a revolution in how we teach science at all grade levels." Revolution in science education? That’s a big claim! Well, attend our webinar — Critical Thinking and Next Generation Science Standards, 3/20/2018, 9 a.m. Pacific/12 p.m. Eastern — and you can decide for yourself! Three-Dimensional Learning: An anchoring idea in NGSS is that learning science means using DCIs (Disciplinary Core Ideas), CCs (Crosscutting Concepts), and SEPs (Science and Engineering Practices) "... in an integrated fashion in order to make sense of phenomena or design solutions to problems.... None of the dimensions can be used in isolation; they work together so that students can build deeper understanding as they grapple with making sense of phenomena or finding solutions to problems." Disciplinary Core Ideas (DCIs): "There are DCIs for each of the four major disciplines: physical sciences, life sciences, Earth and space science and engineering (engineering, technology and applications of science). Each of these disciplines includes no more than four DCIs, reflecting a concerted effort to cull the numerous ideas that all students are expected to know and be able to use." Only four core ideas for each of the areas of science? Traditional science education has always been accused of being "a mile wide and an inch deep" — but hasn’t NGSS gone overboard? No, the claim is that over the years of schooling students will develop deeper and more sophisticated understandings — as the students engage in 3D Learning. Explore and explain — a cornerstone theme in NGSS! “For example, when scientists are trying to understand why some members of a species seem to do better after an environmental change compared to others, they search for differences in the structures in these organisms that yield a functional advantage in the changed environment." 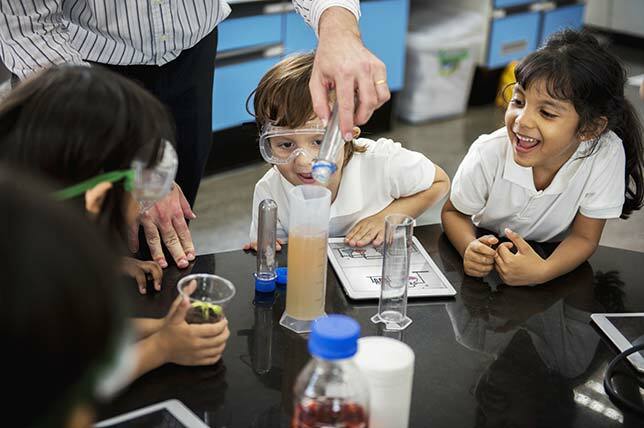 NGSS wants to differentiate “skills” on which traditional science instruction focus from SEPs "to emphasize that engaging in scientific investigation requires not only skill but also knowledge that is specific to each practice." Moreover, NGSS wants to differentiate SEPs from "inquiry" which is a traditional science education notion: "[Inquiry] emphasizes accurate measurement, careful control of variables, and data analysis. Yet most of these types of activities miss what is at the heart of science: building knowledge." SEPs empathize sense making of phenomena by building models, constructing evidence-based explanations and arguing from evidence. Performance Expectation (PE): At the heart of NGSS are PEs — the standards that guide curriculum development and that define expected student performances. Remember: NGSS isn’t about memorizing science facts — so "achievement" isn’t the appropriate assessment model. NGSS is about using scientific knowledge, so "performance" is a more appropriate way to think about assessment. For example: "Students who demonstrate understanding can: ... Plan and conduct an investigation to provide evidence of the effects of balanced and unbalanced forces on the motion of an object." Notice that this PE is made up of a SEP (Plan and conduct ...), a CC (Cause and Effect), and two specific DCIs (Forces and Motion and Types of Interaction). With NGSS, science class will be different. Instead of teachers lecturing, students will be doing science. The learners will be able to figure out why phenomena occur. What is so bad about the polar ice caps melting? How does the melting of polar ice caps impact climate? When science class is driven by questions, students wonder, and it drives them to ask new questions. Scientists figure things out; scientists explain phenomena; scientists build models; scientists build knowledge. Engineers solve problems; engineers design and build things. So, if we are going to teach authentic science and engineering — STEM — then that’s what we should be teaching children to do in school. "The overarching goal of our framework for K-12 science education is to ensure that by the end of 12th grade, all students have some appreciation of the beauty and wonder of science; possess sufficient knowledge of science and engineering to engage in public discussions on related issues; are careful consumers of scientific and technological information related to their everyday lives; are able to continue to learn about science outside school; and have the skills to enter careers of their choice, including (but not limited to) careers in science, engineering and technology." The "beauty and wonder of science and engineering." Yes, yes, students need to be able to engage in conversation, consume science information carefully, blah, blah, blah. Sure! But develop "some appreciation of the beauty and wonder of science and engineering" — really? Yes! Appreciating beauty and wonder wherever is, in IOHO, a highly laudable goal. And, it’s fair to say that the traditional way of teaching science has not gotten students to appreciate the beauty and wonder of science and engineering. So, let’s try another approach, an approach, by the way, that is exceedingly well thought-out. Yes, what’s good for the goose is good for the gander! For a deeper dive into NGSS please join us in our webinar on March 20, 2018 at 9 a.m. Pacific/12 p.m. Eastern.